MF: A lot of posters want to know if MINI will be getting a DSG or equivalent. Stracco Speaks: The only real manufacturer of Dual Clutch Transmissions right now is VW. They don’t have a supplier, they manufacture the DSG themselves. Their front wheel drive box is actually manufactured by VW under license from Borg-Warner. They can afford to manufacture it themselves because they have huge volumes with VW, Seat, Skoda, etc. But, as you could imagine they are not prepared to manufacture those for anyone outside the VW family. Everyone else has a dual clutch gearbox “In development” or something like that. Or if they have one, it’s not appropriate for a MINI. So it will be a while yet. I am not an expert in market feasibility but I would think the "business case" would be very strong seeming that the market would include everyone from a novice motorer to a well experienced driver. 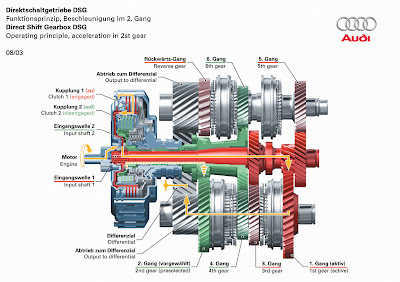 The fact that the DSG transmission could produce faster shift times and ultimately faster cars would get me (and many other enthusiasts) very interested. Hot Dogs and MINIs, what a combo! For what seemed like a casual gathering of a few enthusists set up in a NAM thread, we had a very large crowd show up. I also met up with Juan, of blu-iguana.us fame, who happened to be in the area with his indi blue cooper with well over 100,000 miles on it. Wow! And he gave me a poster with a ton of his pictures! Very cool... I'm getting that framed soon. I had a blast talking with a couple new faces as well as some passers by. I hope we can make this a regular event.